Next weekend I will finally be celebrating Mother’s Day with my mom. Though our celebration will be belated (better late than never! ), I did make this omelet on the actual Mother’s Day with all of my mother’s likings in mind. 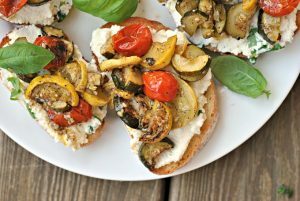 This is the kind of thing my mom would love – healthy, simple, and yet, it offers that wow-factor. I mean, a rolled omelet? Fancy. Of course this was great the morning of Mother’s Day, but Mr. Prevention decided he would not be trying this. While he enjoys spinach and goat cheese, he was offering up some different opinions that morning. While it’s hard to compete with donuts (even I concede this much), this omelet is one healthy, delicious answer to any indulgent breakfast option. Seeing as this was now an omelet for one, I’m so glad it reheated well for the mornings to come. In reality, this was a PERFECT recipe for reheating. A quick 60-70 seconds in the microwave and this omelet was truly just as good on day 2. …and day 3. And 4. My coworkers oooo-ed and ahh-ed at my “fancy” and healthy breakfast as they stared disappointingly at their toast and peanut butter. Whether it be a brunch, or a weekday reheat, this omelet is a must-make! Spray a rimmed baking sheet with oil. Line bottom of pan with parchment, leaving a 1-inch overhang. Spray parchment with oil. In a bowl, whisk together milk and flour. Add eggs, mustard, 1/2 tsp salt, and 1/4 tsp pepper; whisk to combine. Pour into pan. 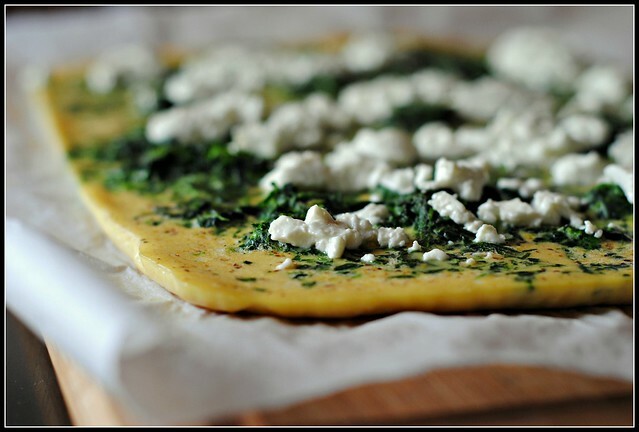 Sprinkle spinach over top in an even layer. Bake until edges of omelet are set, 10 to 12 minutes. Sprinkle with cheese; bake until cheese has softened, 2 to 4 minutes. Beginning at one shorter end, roll up the omelet tightly. Slice and serve. Result: So good! So simple! So chic! 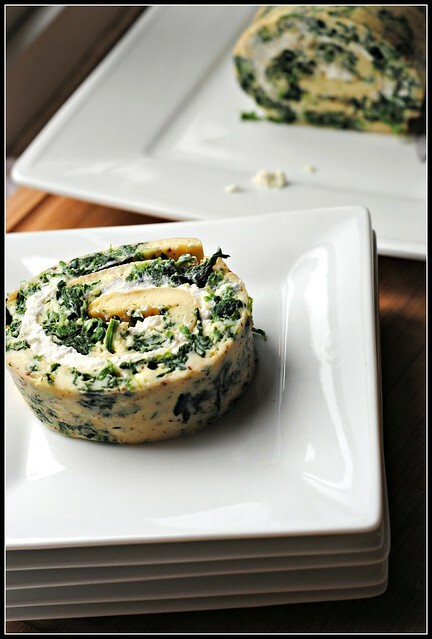 The spinach and goat cheese work so well together. I will note that the original recipe called for cheddar and you can absolutely use any combination you desire. The egg base is a blank canvas and you can really make this omelet your own in many different ways. I must say, however…the goat cheese and spinach were divine and the goat cheese was so creamy that even after being reheated a few days later, this never got dry. Enjoy! I am sad to report that I have an ankle injury. I haven’t a CLUE what happened (perhaps the most annoying part of this all), but I pushed through a painful 3 miles on Friday, stupidly. I think it’s feeling a bit better, but there are times the pain is a “7” on a scale of 1 to 10. 🙁 I am planning to take it easy this week and listen to my body. I think I’ll be breaking out the bike to give a rest from my typical 20 miles of running and elliptical. This looks amazing! I’m a very simple breakfast girl, preferring my cereal, oatmeal, or yogurt bowls. My husband loves breakfast so I’ll have to surprise him with this some time. Looking at your weekly menu, I’m getting excited for when you post those quinoa patties! 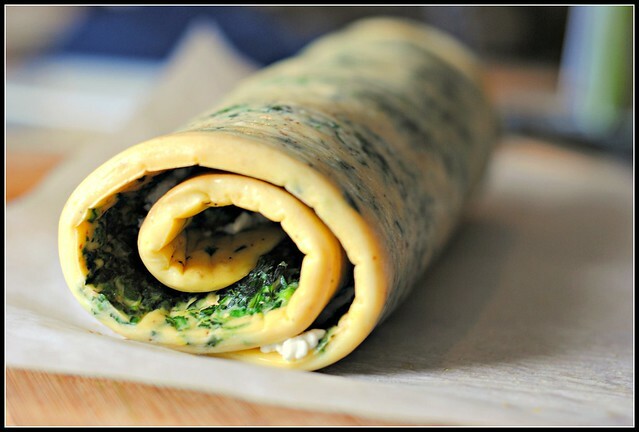 This rolled omelet reminds me SO MUCH of the roulade I made around Christmas…except this has goat cheese! WIN. Love it. OH NO on your ankle! Definitely listen to your body and stretch that bad boy out! Literally the prettiest omlette I’ve ever seen! Love your weekly menu- what an awesome idea!! My mom would love this too – with egg whites. Take care of that ankle! This is coming from someone who had surgery on her ankle and injured it numerous times over the years. It took me a LONG time to listen to my body and let it heal (and in the meantime I caused more and more damage). Really yummy looking! I’d give that ankle a rest for a good week or two and put some moist heat on it(maybe even take some motrin to deal with any minor swelling that may be going on since you said the pain is a 7). If you keep using it before it is fully healed you are just going to make recouping time longer and you might even cause more damage. Love the look of this meal. Definitely perfect to serve up at a brunch. And how can you go wrong with goat cheese and spinach!?! Ooooh, this really is so fancy – I love it! I need to try something like this, I’m a huge fan of eggs and there are so many different flavors you can do! 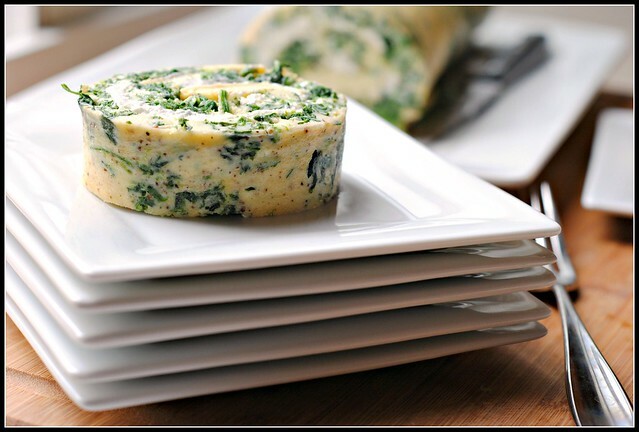 Wonderful recipe and idea of rolling up the omelet. Perfect dish to take out and nutritious too ! This is such a cool idea! I kind of want a “do-over” on Mother’s Day to try this out now! I never would have thought to do something like this! It’s a great idea though, especially since 1.) making multiple omelets takes forever and 2.) making pretty omelets is almost impossible (for me). Hmm I will have to keep this little technique in mind! So fancy. We had burnt Red Velvet Pancakes, as my husband has no idea what to do. At least he tried. Better to celebrate late than NOT to celebrate at all. This looks really good. I adore a good omelet. Ummmmm…… Looks awesome!!! Photos r amazing. Frankly speaking i don’t like Spinach. But i like Omelet. 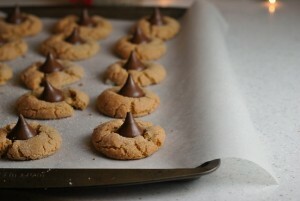 And this recipe is something different to try. It’s a great idea to eat Spinach & eggs. I will definitely try this. Thanks for sharing this with us. This is now a family favorite. We have even changed it to feta with spinach and Kalamata olives. Thanks so much for sharing your recipes! I’m an au pair and sometimes I run out of dinner-ideas. Tonight I made this for the kids dinner and they adored it! (me included) thanks for a fantastic website. Aw, thanks Matilde! Appreciate it!! One of my favorites, for sure…and it’s just so darn pretty! !